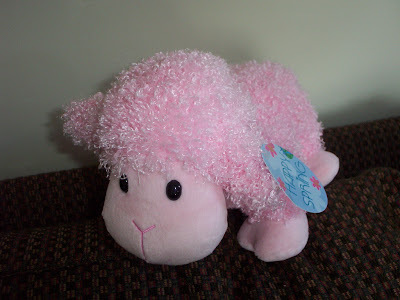 This little lamb is one of Savannah's toys. The tag on it says 'Happy Spring'! Goodbye to April, Hello to May! We've had frost here two nights in a row. It is 36 degrees, and it will go up 40 degrees today to 76. Can you believe it? That is quite a warmup. I might be able to lay outside on a lounge chair at the health club this afternoon. I had a dream last night that I was going to start a new job or return from 'being away'. The place where I was (and I have no idea where I was, but not here) convinced me (and half kidnapped me) to stay and work on this really old computer that nobody knew how to program anymore. I wasn't sure I knew myself! It used greenbar paper if anyone remembers that stuff. I had another dream that I was taking care of a bunch of kids under the age of 8 (or they may even have been adoptive kids) and laughing at their antics and creative play. I wish I remembered more about why I was involved, but I don't! Day 800 - How about that? It's day 800 on the blog! Whoa! The HEAT is running inside and it is 35 degrees outside. Charlie covered the plants in the garden last night but we have no idea if they will make it. Southerners call it 'Locust winter' when the locust trees are in bloom but it turns cold. 'Dogwood winter' would be when it turns cold and the dogwoods are in bloom. Here's a picture I haven't posted already, Savannah sleeping in her swing. Cute! Well, it's 6 already and I haven't packed a lunch yet. Gotta go! TTFN! Day 799 - Happy Birthday, Marcia! 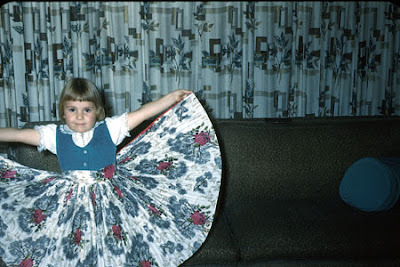 This is a great picture of Marcia from days gone by - clashing with the drapes. I love this picture! What a dress! Note that the top half of the dress looks to be the same material and color as the pillow on the sofa. Is it by chance, or was that color just introduced in fabric at that time? Other names for Marcia are 'Marci Ann' and 'Me Marsh', and 'The Boss'. My nickname 'Kado' (pronounced Kah-doo) was given to me by Marcia when she couldn't say 'Karen'. Hope you have a great day and do something extra special for your birthday, like making some 'Fun Flowers', 'Creepy Crawlers', and 'Creeple People' with plastic goop. Then top off your birthday celebration with a cake you made yourself in your Easy Bake Oven! I can still remember how those cakes tasted, and the smell of the plastic goop baking. We've just had our coffee and we're going to go swim. A little later we are going to check out some 'tax free day' shopping, maybe some new tennis shoes for Charlie. We may also hit a movie. Papa Boudreaux's last night was WONDERFUL as always! Our only disappointment was that we missed a crawfish boil they had last weekend! Boo Hoo! Papa B. himself told us they went through 800 pounds of crawfish. We'll have to catch it next year. By the way - Papa rides an ATV to and from his house to the restaurant when he needs to go get something. Somehow, we managed to eat our dinners AND have dessert! I don't know how, but we did it. (Roll clip of the 'can't believe I ate the whole thing' commercial). Hooray, it's Saturday and it's the weekend. Today I'll go to my 8am water aerobics class, then stop at Sams Club, then get the house ready for company, then go to Papa Boudreaux's for a Cajun feast. Day 796 - Yahoo! Friday! Savannah is surprised that it's Friday already! OMIGOSH - isn't this a cute picture?? Savannah wishes she could march in a circle, chanting 'Fri-day! Fri-day! Fri-day! ', but she's not quite ready to march yet. 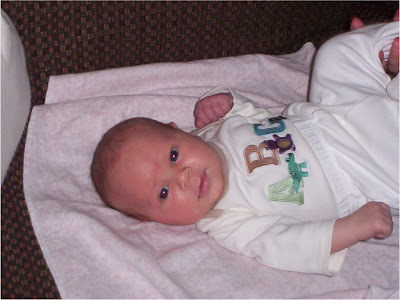 Happy seven weeks old, Savannah! I can't believe it - she is changing so fast and still so alert and interested! Gush Gush Gush - brag, brag, brag. I have had a pleasant week; not as busy at work, and no overnight job issues. Wahoo! Have a great Weekend everyone! Be jealous when I'm at Papa Boudreaux's tomorrow! This is going to be a short blog because we overslept a bit this morning - for unknown reasons. We turned off two separate alarms and then went back to sleep - how does that happen? I think it's supposed to be 83 today - I am hurriedly pulling summer clothes to wear out of the guest room closet! Capris pants and short sleeved shirts, here I come! I felt that yesterday should have been a Friday, and now that it's Thursday I feel like today should be Friday. And speaking of Friday - this weekend is Tax-free weekend for clothes and shoes and computers and school supplies and such. You New Englanders already don't have tax on clothing. Looking ahead to Saturday - a trip to Papa Boudreaux's Cajun Cafe for Charlie's daughter's birthday dinner. YUM-O! Here's another adorable Savannah photo. I wonder if I could relax to that extent? Talk about 'power naps' - eh? It was around 80 yesterday and I did a half hour workout at the pool and then lay outside on a lounge chair for a few minutes in the sunshine - boy did it feel great! One of my water aerobics instructors stuck her head out the door and said 'Karen? Is that you? I recognized your bathing suit!' I guess I'm the only person who buys their Speedo suits at Sams Club. Stepdad Gil calls them 'speedies', by the way. Nancy - the snack I was talking about that I am addicted to is Seapoint Farms Dry Roasted Edamame (soybeans) - they taste like a cross between a pistachio nut and a pumpkin seed. I buy them by the case from Amazon.com, and by the way - you can get free shipping. Monday is OVER, and it wasn't even a bad one. 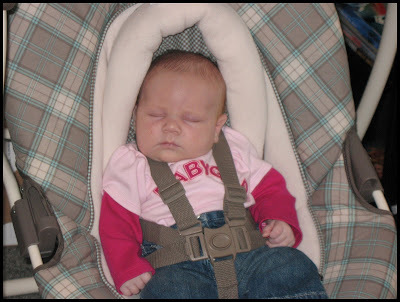 Shhhhh - Savannah is sleeping in her swing. Would you look at that cute spring outfit? Lyn and Heather - Surprise! I am shipping a case (two packs of 12 bags each) of those dry roasted Edamame snacks to Lyns house for you folks to enjoy. I'll let you know when I get the shipping email. We all got addicted to them during my visit. Lyn - when they arrive, please let Heather know and she can bring the BABY BY to see you! Day 792 - Nice weekend, but it's Monday! 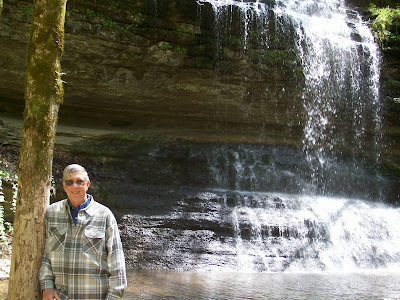 Looky here - it's Charlie, at the bottom of the Stillhouse Hollow Falls waterfall. Remember I posted a picture of it a week or two ago? We drove out there and hiked the trail yesterday. You can choose whether to hike down just to the top of the falls, or keep going to the bottom of the falls. It's easy enough going DOWN, although pretty steep. We also had to cross a stream by stepping on rocks, (effortless for Charlie with his long legs, but not quite as easy for me). Anyway - it was a beautiful day in the low 70's, and we had a great time. There were so many wildflowers in bloom and all the trees are getting leaves. Have a great Monday, everyone! TTFN! Greetings, Blogregation! It's Sunday already! Sunday story - yesterday I was behind a car with a vanity plate something like 'HVNBND'. My first thought was 'Haven Bound?' Where is the Haven?' until I realized it meant 'Heaven Bound'. Sounds overconfident if you ask me! Ha! No time for bloggage AGAIN, apologies in advance. Charlie and I are leaving shortly for the health club, and maybe going for a hike later. It's supposed to be low 70's here, and maybe 80 later in the week. Day 790 - Ahhhh - the weekend is here! No time for bloggage, I need to leave for water aerobics in 15 minutes, then run errands. Day 789 and Friday is FINE! It's FRIDAY, FRIDAY, FRIDAY! This week flew by. You know what to do - march in a circle doin' the happy feet Friday dance. 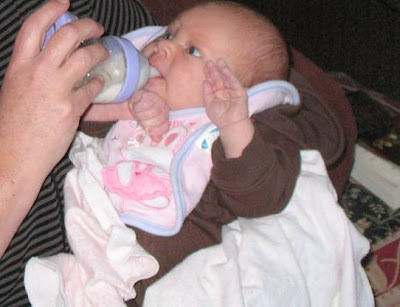 This is a picture of my attempt to feed Savannah - she didn't like the bottle at all, but it was fun trying and a cute picture of her face! Hey - newsflash this morning - there was an EARTHQUAKE this morning in Indiana that was felt as far away as Middle Tennessee! (no, we didn't feel it here at the house - I would have thought it was the blackberry going off). It is true that Tennessee is affected by the New Madrid fault line, and believe it or not, our homeowners insurance has some earthquake coverage. Gotta go! Have a great Friday and a great weekend! Day 788 - Thursday is Swingin'! I'm running late because I was catching up on my email and looking at some new pix of Savannah. 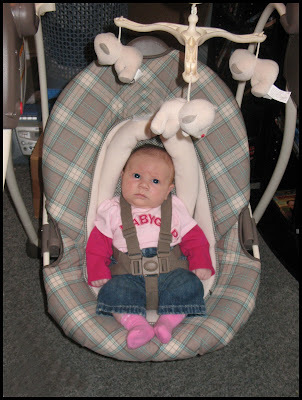 Here is Savannah, 'semi-enjoying' her first swing ride... That is HILARIOUS! 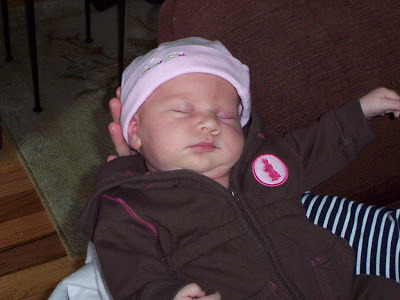 Absolutely adorable, and I love the 'Baby Gap' shirt - is that the one I got for her, Heather? Well, I've got to go, folks - duty calls. 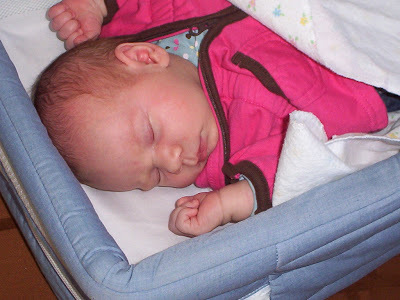 This is Savannah in her little portable bed that folds up into a square that looks like a booster seat. She looks squashed, but she isn't. We had a frost last night (and Apr 15 is supposed to be the last freeze date for the South) and the night before. By the weekend, it may hit 80 degrees. I have GOT to get some hot weather clothes out of the closet and wash them before then! Charlies tomato seedlings didn't make it, and he had even moved them to the barn! Freeze, then boil. Freeze, then boil. So - did everyone get their taxes filed? Hope so! Most of the folks at work told me they had mailed them out long ago like we did. Charlie made us a big fritatta (dinner omelet) for supper last night - it was AWESOME. I am liking his retirement just fine, thank you very much. Day 786 - Twofer Taxday! Did you file your taxes yet? If not, today's the day! Did you notice that every one of us has paid good money for this type of sock, with the very same unsatisfactory result? Multiply that by millions of people, and realize what a racket they have going for something that just doesn't work! Anyway - I have the solution. For all you inventors out there, this was my idea but just give me a royalty for it when you take it to market. Take your standard 'Peds-style' footie sock and knit on a slightly wider edge (that is now just thin hose). Around that edge on the inside, spray on a thin layer of rubberization, like they use on the outside of slipper socks or around the waistband of pantyhose. That might just be enough to hold them on your foot BETTER than all the millions of socks in use out there. Just building a better mousetrap on 'da blog'. Update at 6:28am - I already thought of a better way. Knit the whole sock with waistband elastic - the outside will be soft, and the entire inside will be rubberized. Whaddya think? This morning's photo is of Heather, not Savannah. 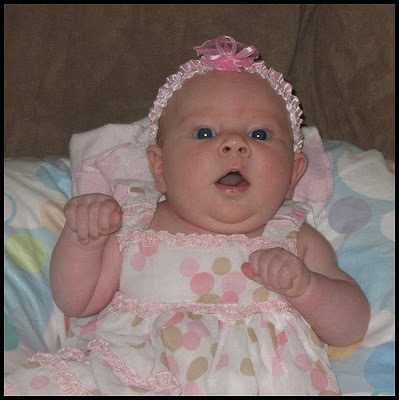 It was taken by Women and Infants hospital in Providence when she was just hours old, and she had a cute little smile already! I need a similar one of Savannah to compare. They sell a hundred different kinds of ‘peds’ – the pantyhose-like slip on foot covers so your shoes don’t rub. I have purchased package after package after package of them. Would someone please tell me how to keep them ON MY FEET???? First complaint – they disappear in the laundry, even more often than regular socks. Second complaint – they work for approximately 30 seconds, then slip off your heel. Third complaint – I shot one across the room yesterday like a rubber band trying to put it back on. It’s behind the computer now. I told Charlie about it and he fished it out. I used it to dust the table and then threw it in the trash. That's all for now, folks! Happy Monday! 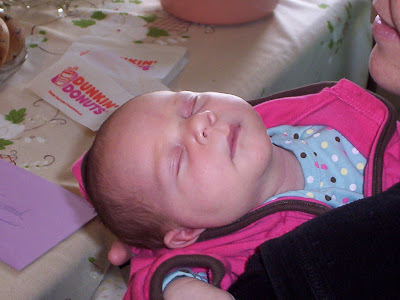 Dunkin Donuts gets a free plug from the napkins on the table - we ate a LOT of DD Bagelage while I was in Rhode Island. I liked the 'Everything' and plain bagels the best. Contemplation - why are poppy seeds the worst things ever to get stuck in your teeth? I think they are worse than pepper. Charlie and I are leaving shortly for a workout, and I still have an issue with a weekend job. So - things are normal - TTFN! I have to leave for water aerobics shortly, but here is a delicious picture of the bagels Joe brought me (time before last) from K&K in Mt. Juliet. 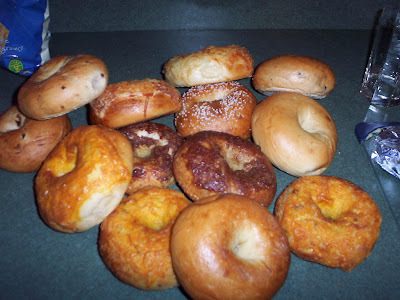 Featured here are plain bagels, cheese topped bagels, cinnamon sugar topped bagels, pretzel bagels in the back topped with salt (they are awesome), a couple of jalapeno cheese bagels, and a couple of blueberry bagels. The bagels there are unbelievably good. Someday Savannah will be old enough to chew on a bagel - if she's like her grandmother, she'll love them. Savannah is sleepy this morning, according to the picture. I'm feeling pretty good, because it's Friday! He drove an hour and a half pulling his boat to the lake, launched his boat in the water, and started fishing. He broke his brand new fishing rod within 20 minutes (got snagged on something which hung up the line and then broke the rod) and didn't have another one with him. Poor thing! EEk - I'm running a bit late this morning so no time for more bloggage. TTFN! Darling Savannah is back on display - we all love it when she sleeps with her hands curled up next to her face. 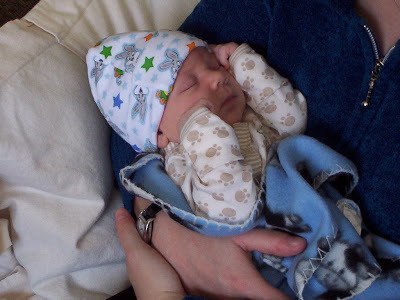 She has a Bugs Bunny hat on, paw print onesie, and the blue blanket has cows on it. I slept SOUNDLY last night and didn't wake up until 4:45. That was lovely. The older I get, the more restlessly I sleep (or maybe it's just work that does that). I don't remember any of my dreams last night. I don't think I even moved around much! Maybe it's because I got in a workout yesterday at lunchtime. That is definitely a plus. We are going to have temps in the high 70's today with a possibility of strong storms moving in from Texas. Hopefully they'll lose some of their energy by the time they arrive. Newsflash - Charlie is out in the garage doing turkey calls again... Isn't he cute?It's that time of year! Today's photo (as you see), is not of Savannah, but since Charlie took it, I wanted to show you this lovely place! Photos of Savannah will return tomorrow! 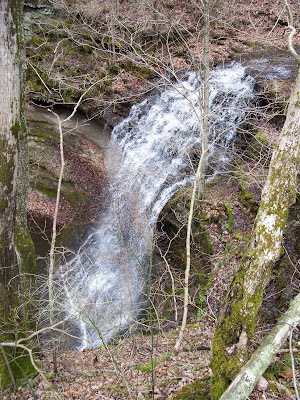 The photo is of the falls in Stillhouse Hollow Natural Area in Maury County, TN. 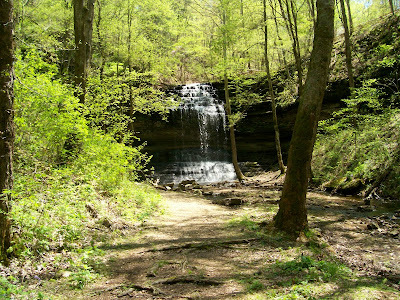 There is a 2/3 mile trail to get to the waterfall, and it is bigger than it looks in the photo! Thanks, Charlie for checking it out! You can read more about it on the state recreation website - it is a 90 acre natural area that was just recently acquired by the state in 2006. That's a good thing, because the walkways and bridges are new! I dreamed about going hiking last night, and dreamed I returned to my car afterwards and had left my key in the ignition and my pocketbook IN the car! My drivers door wasn't shut tight, and I checked my wallet to see if my money was gone, which it was not. What was funny about the dream is I even remembered in my dream what money I had in my wallet! I made it through my first day back at work. 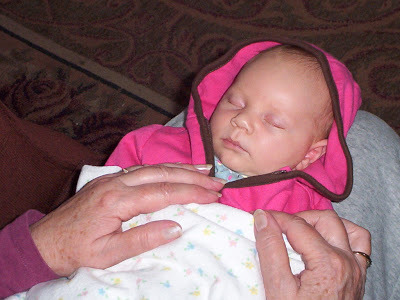 This is little Savannah sleeping on Great Grammy Peggy's lap. She said her mother used to do that. Since her mother (my grandmother) was an expert at raising children, it's worth mentioning! I didn't sleep well last night and boy it shows! Here's Little Miss Adorable Savannah, grinning because I am talking about her. What's a grandmother supposed to do, anyway? Be annoyingly gushy all the time, I guess. I've got to make this short because it's MONDAY and I have a whole lot of catching up to do at work this week. Wish me luck! Day 777 - Gotta go SWIM! I am back in Tennessee, which means Charlie and I will be leaving shortly to go swim. It also means I'm back in the land of church signs. One that I passed yesterday on the way home said 'When prayers go UP, blessings come DOWN'. We know who we are blessed with! 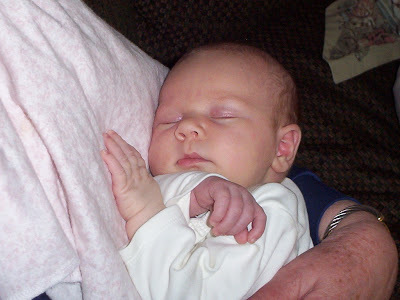 This is the last picture I took yesterday, Savannah sleeping in her great-grammy Peggy's arms. I took about 100 pictures, and need to get rid of any blurry ones. Today I need to get organized, hit Sams Club and the supermarket. Have a nice Sunday! Heather, maybe we can do a Grammy Cammy sometime later! I miss everyone already! Sigh - I could just go on and on, whining about leaving, so I'd better talk about something else. I had a wonderful time yesterday where I used to work - a whopping FOURTEEN YEARS ago. I have a funny story about my arrival. It was pouring rain. My brother in law dropped me off at lunchtime, and I walked down the sidewalk to the front door. The front door wasn't THERE anymore! After some disorientation, I got rather wet walking to the side door which is the 'new' front entrance. 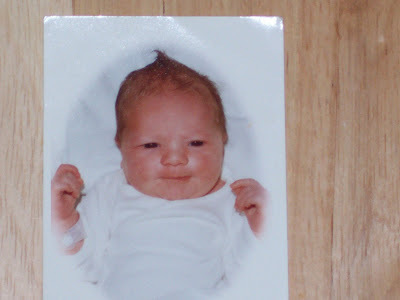 A lot changes in fourteen years! It was so nice to sit and chat with 'the gang'. Believe it or not, there were at least a dozen people still working there who I remember, and who remembered me. It brought back so many memories! My friend Cheryl brought in lunch enough for several people. Thanks, Cher! Two of my former co-workers (my Manager and Team Lead) were so thoughtful, bringing gifts for Savannah. One of them was in a musical gift bag that played a lullaby when you opened it. Savannah loves her glow worm toy and fluffy pink blankie! It was so touching. Thanks so much, BV and TB! Other former co-workers came by with photos - children who were babies when I left, with prom and college pictures now! I have a friend - Ellen - who I seldom see. She always says we are 'far away but always close', meaning that your friends are always safe and sound in your heart, right where they ought to be! TTFN - gotta fly back to Tennessee this afternoon! I couldn't take it another minute!!! I just booked a flight on Southwest Airlines to come back for Memorial Weekend to see Savannah again! Day 775 - Oh No! It's Friday! Friday means I am leaving tomorrow and won't get to spend every day looking at Savannah's sweet little face! Boo Hoo! Of course I miss Charlie and my Tennessee home (and the weather there! ), but I will also miss seeing Savannah changing every week! Stomp around in a circle instead of marching. It's rainy and grey here, all the more dreary for a Friday. My brother in law said they're going to put a statue of me in the living room so Heather will still bring the baby over to visit. I thought that was funny! Day 774 - Thursday already! 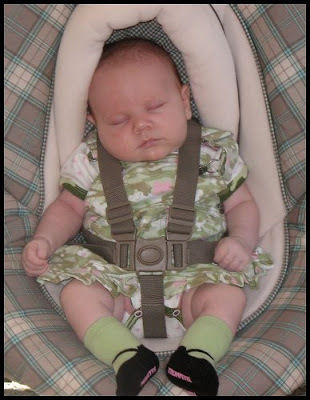 Big news - Savannah is 4 weeks old today. Happy one month anniversary, Savannah! It's Thursday already, I can't believe it. The week is going by too fast! I have to print my boarding passes tomorrow afternoon, boo hoo! We had another nice day yesterday - spent time with Heather, Savannah and Evan, watched a Red Sox game, and had Chinese food for lunch (Chow mein, lo mein, moo shu, egg rolls, fried rice). We also took a walk to Dunkin Donuts for iced coffees. The weather here is cool and windy. Later this morning I am accompanying Heather to her doctors appointment (I get to hold Savannah while she is seeing the doctor), and we're going to Mike's Mom's for dinner. Have a nice day and TTFN! Here's a cute picture of Savannah that I cropped from another photo. Isn't she the most darling thing??? Omigosh, it's the middle of the week already, it's going by too fast! Help! We had a delicious seafood feast last night at Perellas. There were 7 adults and one baby in our party. They first bring out baskets of Italian bread with butter, and foil packets of roasted garlic to spread on it. We then shared a huge order of calamari with garlic butter and hot peppers, and an order of seafood stuffed mushrooms. Entrees - Evan had 'steak a la mama' with pasta. Our friend Tab had chicken and artichoke hearts over penne. I had some eggplant rollatini (stuffed eggplant rolls) and littleneck clams in garlic and oil. Steve had chicken parmesan and salad. Lyn had italian bean soup and littlenecks. Heather had littlenecks in garlic and oil and a salad. It was all delicous, and reasonably priced. Evan wants to go out to lunch today, surprise surprise! Day 772 - April Fools! I thought of things I could do for April fools (like saying I quit the blog), but I'm too lazy to bother. Lyn and Steve were visiting us in Tennessee last year, because Steve told me I had a flat tire for April fools day, and we all believed him. Then we went for a drive on the Natchez trace without having to fix the tire. My mother reminded us of the time we swapped the sugar in the sugar bowl for salt when we were kids. Our father figured it out the first time, but we did it again and again until he was thoroughly annoyed. This afternoon a group of us (including Savannah) are going out to Perellas restaurant for Clams and Calamari - that will be the highlight of the day. Nancy - you won't see pictures from the trip until I return, they are in my camera and staying there until I get back. I take a few each day so I get Savannah in different outfits. Happy April Fools, everyone! Be wary today!